A little while ago I saw an article online about how a lady had donated her wedding dress to make gowns for stillborn babies and thought it was a great idea. By the time I got round to getting my dress down from the loft, Cherished Gowns were no longer taking donations – clearly the Mail’s article had done wonders – so I went about finding other charities, when I stumbled across Heavenly Gowns UK, a voluntary, non-profit organisation set up to help bereaved parents and family members at the unimaginable time of the passing of a baby. I sent them a Facebook message and within an hour they came back with their address. 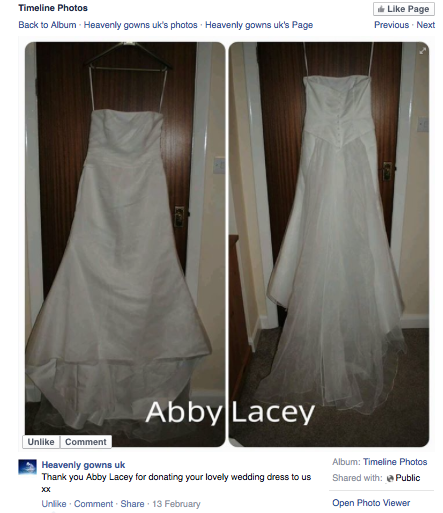 I packaged up my dress and popped it in the post and was thrilled a few days later when I received, not only a private message on Facebook, but also a post of pictures showing they’d received the dress and would be starting work on it soon. Come back to see how they used my dress to make some wonderful clothes. The other day, someone asked me in the school playground “How many days?”. I replied perplexed, “How many day ’til what?” and of course what she meant was until I’m 40. I’ve been so busy lately, I had lost track and so I’ve worked it out: today I am 39 & 3/4. Categories: 40b440 | Tags: 40b440, 40b440 update, things to do before you're 40 | Permalink.